Reservations are accepted based on availability. Specific location requests are honored whenever possible, but not guaranteed. In the event that a particular room is not available, we reserve the right to place you in the most similar accommodations available. You must be 21 years of age or older; and present a valid credit card with matching ID upon arrival. Check-In time is after 3:00 p.m. If you plan to arrive earlier than 3 p.m., please let us know an every effort to accommodate your early arrival will be made although rooms are not guaranteed to be ready until check-in time. Check-Out time is 11:00 a.m. If Check-Out is after 12:00 p.m., a $40 fee will be charged. If Check-Out is after 4:00 p.m., a full day rate will be charged. An advanced payment of your first night including tax will be charged to your credit card at the time of booking. If your travel plans change and you must cancel your reservation, please call us at least 72 hours prior to your scheduled arrival date to cancel your reservation and receive a full refund. In the unlikely event that you must cancel with less than 72 hours notice, shorten your stay or check out early, please understand that we must ask you to take responsibility for your entire reservation. However we will refund the charge if we can completely re-book your room(s). Special deposit/cancellation policies may be in effect for the Blues Festival (July), Lobster Festival (July/August), Harbor & Boats Show (August), Holiday Weekends, Suite Rooms and Multiple Night or Group Reservations. If you make a reservation on-line that involves any of these particulars we will contact you to discuss the specific requirements. There is a $10.00 charge for each additional adult in a double occupancy room. Suite rates include up to 4 persons. Children 13 years of age and under stay free in parents’ room. Children 14 – 17 are charged $10.00 extra per night. Please note there is a maximum of four people per room, unless otherwise noted. 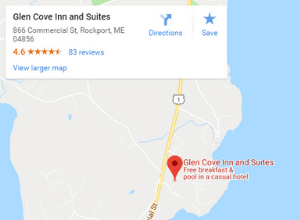 The Glen Cove Inn features rooms specially designated for pets. Extra charges apply. Pets must be domestically trained and on a leash at all times. Please see our pet-friendly information before making a reservation. All pet-friendly room reservation must be verified via phone or email. We accept MasterCard, VISA, AMEX and Discover. Please note that all published and /or quoted room rates are subject to Maine State Sales Tax (currently 8%).